As expected, Infinity War, the latest Avengers movie, has become a box office success in America’s theaters since its first week of release. The Marvel saga has gathered this time more than a score of superheroes from its catalog to unite against a common enemy, Thanos, and as is logical, the curiosity of the public to see the pleiad of the super gifted arrived at 630 millions of dollars collected around the world, 250 million dollars only in the United States. But, the Avangers have another hidden card; this collected amount of money has not been have yet the numbers in China, where it will be released on May 11. The specialist company Exhibitor Relations commented on the success of Avengers: Infinity War that will break the box office records for a premiere in its first weeks, world premiered on April 23, 2018, in Los Angeles, and on April 27, 2018, in IMAX and 3D. Its sequel, still without title, is scheduled to be premiered on May 3, 2019. Marvel’s premiere - like it has happened with other of its films - does not really contribute to cinema as art, but as pure entertainment. And although art and film critics show their dissatisfaction, the placebo effect and the relaxation of Marvel films is very well received by those who go to the cinema to alienate themselves from every day’s reality. It is through Marvel’s universe that they find their alter-ego in the characters. Smashing scenes, amazing special effects, colorful costumes and photography - more or less successful - are part of the charms of the film, which narrates the adventures of more than twenty heroes of the Marvel catalog. And as usually, there is always a bad, bad guy who wants to destroy the universe and leave it in pieces to seize its riches to conquest other ones. Evidently, the arguments of these scripts are easily attainable if one looks at the daily reality of US foreign policy. The most curious thing is these heroes are always Americans or at least they live in the "Land of Freedom", where they destroy and unmake cities at will and nobody demands whys, neither the Senate, nor the FBI, nor the president, not even Robert Mueller. After all, they are the world’s saviors. Trivial, light and short-lasting, all adjectives suit perfectly to qualify the films of the great comics’ producer, the one that delighted the audience, from X-men to Captain America. Despite this undeniable reality, there is the success it causes in the public. 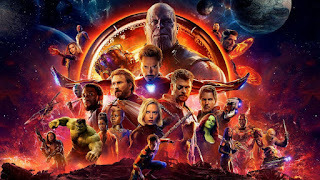 In order to have an idea of how far Avangers could go in its latest version, it has already defeated the latest film of the Star Wars saga. Marvel knows very well how to wrap banality and entertainment in a little-complex narrative suitable for almost all ages since the doses of violence and destruction are not what we could say, very "educational". There is as well the comic nuance or flashes of humor that saves the main characters from being boxy beings, even if they are super heroes. On this occasion Marvel wanted to touch each of spectators. It is known that the writers of Marvel are very skilled building archetypal characters, with whom viewers sympathize, even when many – including myself - have never read one of their comics. In Avangers all of them converge, as a whole, but the adventures of these super heroes in their individual sagas, sometimes, are unrelated. I am still astonished that the film franchise has used different actors to play Hulk. However, at Avangers, is still Mark Ruffalo who performs it. Nobody knows the reasons and nobody has given an explanation either. The truth is that the individual films of each one of these big guys is a narrative disaster and even staging, with already known plots. Nevertheless, Avengers has maintained, to a large extent, a common thread in all of its sequels. The characters have human conflicts and there is disparity and opposition among them despite being all fighting for the same cause: to save the Earth. Yet, in this latest film, pending issues remain between Captain America and Iron Man. But this is secondary because in the end what matters to Marvel’s producers and directors is to raise exorbitant amounts of money. In addition, they clearly set that Americans are the best and indispensable to maintain universal order. Yes, we must un-blind ourselves. These visually "sweetened" films, full of action, combats and romance - rather sporadic- are the cover for the ideological capsule and the hegemonic message launched by the United States. The movie, that has been the culmination of 18 Marvel films, was made to surprise but, mainly, to offer a morbid interest to the spectators on what will happen with these super heroes and how they work together. The plot, too intense, sometimes is missed by directors Anthony and Joe Russo, who try to remediate it by giving more weight to the antagonist, Thanos, a villain that apparently Marvel wanted to save and give him more personality, almost up to the superheroes’ level. Avengers: Infinity War “is the 19th movie of the Marvel Cinematic Universe, (MCU)”, and precedes the one to be released in 2019. As reported, this will be the last of a cycle that may re-start, this time with a new one related to the villains. The movie was announced in October 2014 as Avengers: Infinity War - Part 1. The Russo brothers had the task to direct in April 2015 and on May, Markus and McFeely signed to write it screenplay. The shooting began in January 2017 at Pinewood Atlanta Studios in Fayette County, Georgia, and finished in July 2017, filmed consecutively with its direct sequel. The additional filming took place in Scotland, England, the Atlanta’s downtown area and the city of New York.